* Three nights at The American Club or Inn on Woodlake. *Four, 18-hole rounds of golf per person. 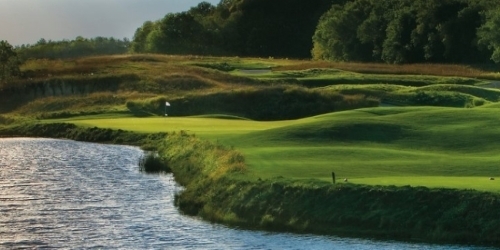 One round on each of the following courses: The Straits and The Irish at Whistling Straits, The River and The Meadow Valleys at Blackwolf Run. * 1/2 hour golf lesson with Kohler Golf Academy instructor. All lessons include video analysis with the state-of-the-art JC Video system. Advance reservations required. Please book lesson at time of booking the Dye-abolical Package. * Complimentary green fees for replay golf with opportunity to book in advance on The Meadow Valleys at Blackwolf Run and The Irish at Whistling Straits. Golf car, caddie fees and gratuities not included. Blackwolf Run - Meadow Valleys reserves the right to change price and offer at anytime. Prices and offer are subject to change without notice. GolfWisconsin.com is not responsible for errors posted in this golf package.